The applications of lidar (Light Detection and Ranging) systems are wide-ranging, enabling everything from high-resolution mapping to the control and navigation of self-driving vehicles. 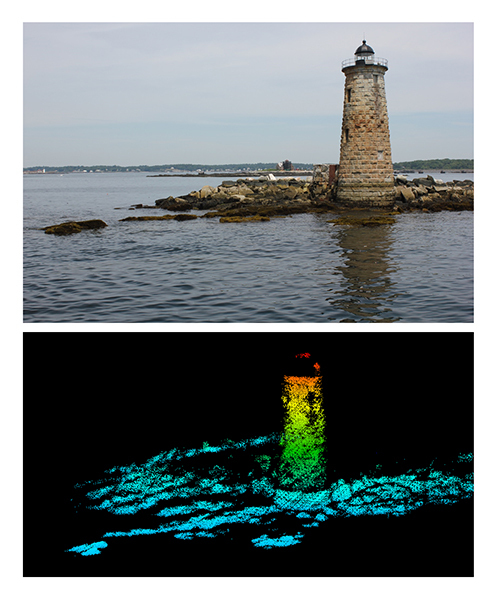 NOAA’s Office of Coast Survey uses lidar-derived bathymetry for charting applications where available, and investigates the use of lidar systems for the acquisition and determination of shoreline features. The goal is to explore how vessel-mounted laser scanning systems can increase the accuracy of feature data for application to NOAA’s navigation products, as well as the safety and efficiency of data acquisition by NOAA hydrographic survey personnel. 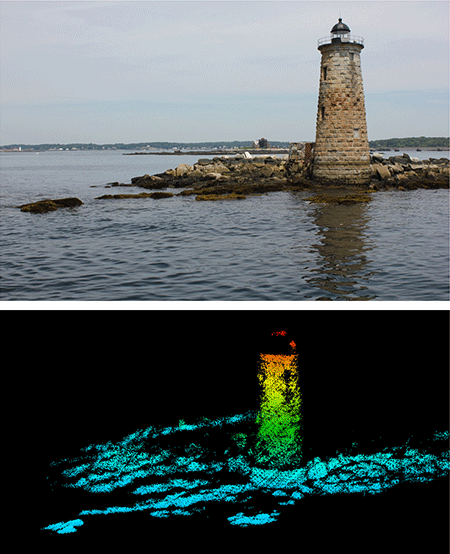 Lidar point cloud depicting Whaleback Light, Kittery Point, Maine. Performing laser scanner operations on a hydrographic survey launch. Calibrating a laser scanner system using an aid to navigation (AToN). Safety - Shoreline features such as wrecks, rocks, and obstructions pose a danger to navigation. Laser scanning systems can accurately detect such features from a greater distance as compared with traditional methods, thus increasing the safety of data acquisition by NOAA hydrographic survey personnel. 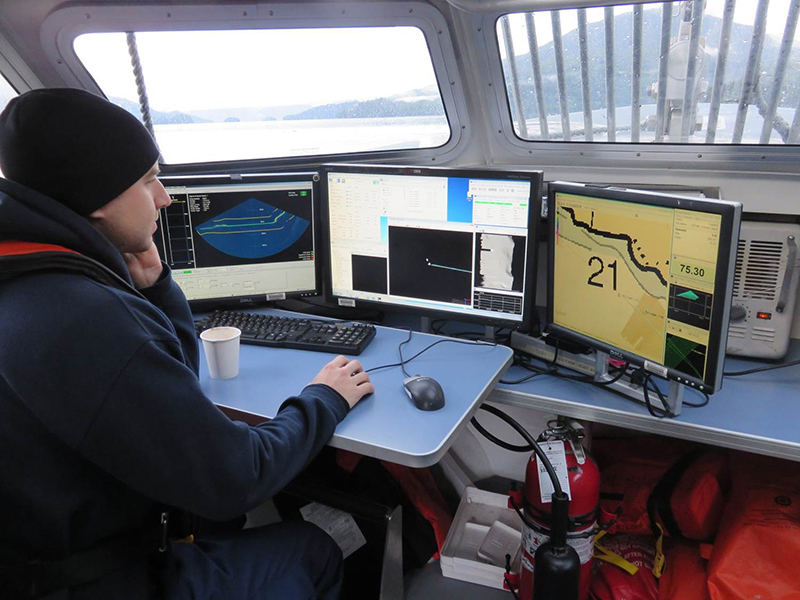 Efficiency - Shoreline features are acquired by vessel-mounted laser scanning systems while the hydrographic survey vessel is underway conducting multibeam sonar operations at survey speed (typically 10 knots), leading to greater overall data acquisition efficiency. Throughput - Automation significantly shortens the time required for post-processing shoreline features from laser scanner data, thus increasing the throughput of survey operations. Accuracy - Laser scanning systems position shoreline features with greater accuracies compared with traditional methods. General Topography - A 3D georeferenced point cloud dataset of the shoreline topography can be utilized by end users with a wide variety of interests related to coastal zone management. Georeferenced Photographs - Georeferenced photographs of the shoreline, collected simultaneously with the lidar data, can provide additional information complementary to the shoreline topography. 16 - Number of channels in each laser-scanning system deployed on NOAA hydrographic survey vessels. 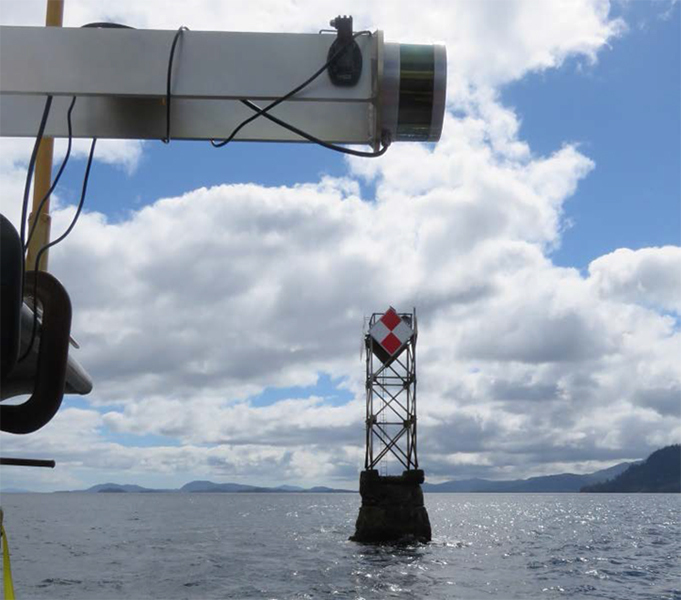 50-70 - Maximum effective range (distance), in meters, of systems currently in use by Coast Survey. 100-300% - Increase in efficiency of shoreline data acquisition, when compared with traditional (manual) methods. 95,000 - Miles of coastal shoreline NOAA is responsible for charting. 300,000 - Number of data points per second acquired by laser systems currently in use by Coast Survey.